People had argued why the leaders and elders of the Southeast region are being avoided and/or sidelined by the Indigenous People of Biafra, IPOB, in their pursuit for a sovereign Biafra nation. Some who have foresight made various suggestions in support of the stand while others criticized against such stand. It was criticized because the struggle was not rested on the shoulders of the political juggernauts in the region. They believed that the success of the struggle lies in the hands of politicians in the region as they are the only means through which the issue can be laid at the floor of the Senate for debate and resolution. But unknown to the arguers, these so-called leaders are not what they claim to be. The IPOB know the caliber of people that parade themselves as the leaders of Southeast. They are the most slavish and self-centered set of leaders. Their conspiracy with the northern elders who have been seeking for all means to stop the agitation for Biafra; to incite violence and cause confusion in the camp of IPOB, so as to term them terrorists and disperse them; coupled with the endorsement of the Operation Python Dance II in the Southeast, is so alarming. They have clearly proven to all that they are only after their own interests and that of the cabals. 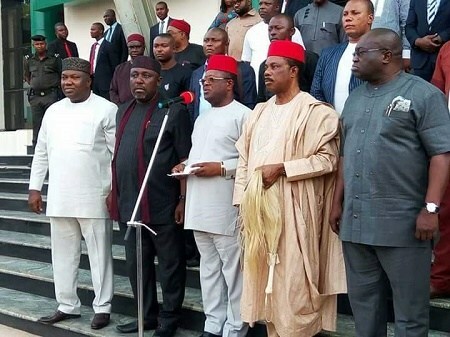 The proscription of IPOB is a plan by Southeast governors to please the northern cabals and on the other hand, bring an abrupt end to the peaceful movement of the people in expressing their disapproval of the grave inhumane treatment, abuse and marginalization they have suffered from the hands of the Nigerian government since after the brutal Nigeria-Biafra war. They have sacrificed the interest of the populace, their own people on the altar of gaining political relevance and other mundane material wealth and unmerited upliftment. What a shame! Leaders who cannot protect or fight for the collective cause of the people they lead, are not worth to be addressed as leaders. No! They are best known and described as “massa”. A massa, during the era of slave trade, is a slave who oversees other slaves for his slave master. He goes on to subject other slaves to severe punishments so as to please his slave master and get more rewards from him. It is on record that the UN issued orders to arrest the Arewa youths who threatened genocidal quit notice on Igbos at the expiration of October 1st, but the northern leaders and elders rebuffed the order and dared the Federal government to arrest them and till date they have not been arrested. Despite how grievous the notice is in both local and international laws, the northern youths were shielded by their leaders to the chagrin of all. To prove how desperate our so-called Eastern governors are in dancing to the tune of the northern cabals so as to retain their political offices, they had to unconstitutionally proscribe the activities of IPOB even before the court passed the unconstitutional order and gazetting of the proscription. How would a sane leader who claims to have the interest of his people at heart not seek for a peaceful resolution to a genuine agitation with the aggrieved populace but instead conspires to dehumanize and kill them? This is simply the highest order of human slavery. To buttress and water down the obnoxious carnage against the people, they made decision to obtain law prohibiting hate speech in the state. It is so glaring now to all, especially the critics of IPOB that these so-called Southeast leaders are stooges of the Northern Hausa/Fulani oligarchy. They assented with the north to decimate Biafrans and in order to have parallel access to offices. This is why they would rather run to north to seek for their masters’ advice than sit together with the people they lead to resolve issues. No discerning mind knows them. They do not have the interest of the populace at heart and cannot lay claim to any gathering of people in any part of South they govern and in any part of the world where their stolen wealth was not used to pay for their gathering. They are the worst and foolish leaders ever for accepting to be used as slave tools in killing their own people. Good leaders are known by their works and love for their people. They are known by their respect and loyalty to the people but the reverse is the case for our so-called Southeast governors. Their love for wealth is glaringly overwhelming. No wonder they willingly betray and sabotage every struggle aimed at benefitting the people and making irrational laws and policies targeted at shutting down the minds and memories of their people from expressing the I'll-treatments meted out to them. Unlike Nnamdi Kanu who speaks the minds of the people and walks to the streets freely without security but draws mammoth crowd anywhere he goes, they cannot as well walk freely on the streets without flooding everywhere with armed security men. If they claim they are for the people and loved by the people, then let them walk the streets of Biafraland without security for a minute to prove this assertion. As election approaches, you will see these hypocrites sharing money in the streets while there are thousands of civil servants and pensioners dying of neglect and starvation as a result of non-payment of salaries and pension arrears. Without rigging and begging, and of course threats, they cannot record any success in any election. In democracy, the will of the people serves as the basis for collective decisions. It is called self-governance. Each member of the population expresses his or her opinion on each issue through voting. If the Southeast governors are civilized enough and are practicing democracy, let them allow the decision/opinions of the majority of the masses whose mandate they rode to power, hold in resolving the Biafra agitation. All what the people want is a referendum date. The people have spoken and the voice of the people is the voice of God. It is however, most profitable that the governors respect the resolution of the majority of the masses instead of suppressing them and put in motion the necessary machineries in place and allow justice to prevail in the quest to restore Biafra just like it was recently done in Spain, Iraq and other countries. Injustice against one is an injustice against all. In Biafra remains our right not a privilege. And in Biafra we the masses stand. A bunch of coward, dishonorable, political prostitutes and slaves of the Hausa-Fulani. A shameless and disgraceful bunch to Ala Igbo and Biafrans in general. They must surely reap their rewards at the appropriate time - no matter where they run to as long as it is on this planet earth.